We started our brand by working closely with celebrities and the music industry on their style. Our glitter was inspired by working behind the scenes on music videos, backstage preparing for tours and festival stage performances including the likes of Coachella. We have designed our own glitters for you bringing some sparkle from our world. 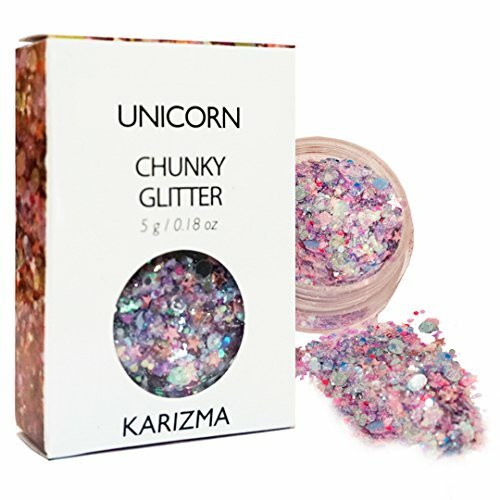 The KARIZMA glitter is your secret weapon to get that superstar glow. STYLING Wear these as an eyeliner in the evening, under your eyes at festivals, sprinkled onto wet nails and in your hair braids for summer pool parties. Mix our colours together and the possibilities of beauty looks are endless. Tag us on instagram, we can't wait to see what you create. HOW TO APPLY Our glitter can be easily applied using a multi purpose balm for a an easy and comfortable application. Apply with your fingertips or a brush and remove using makeup remover. 100% MONEY BACK GUARANTEE: If, for whatever reason, you don't absolutely love your KARIZMA order, simply return it, and we'll refund every penny (or send a replacement, if there is a problem). QUICK DELIVERY: We aim to dispatch our glitters within 1 working day to deliver your beauty products to you as soon as possible for your parties, festivals and holidays, we ship worldwide.